The TARA Light Stand can be used with any TARA Automatic Gate Control (AGC) to enhance the racing experience by providing staging lights. Designed like a standard traffic light, the unit features a light gray heavy gage steel enclosure complete with shades for the greatest visibility. The Light Stand comes in one model: A four light stand. 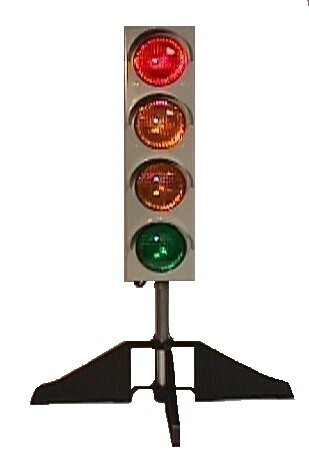 On the four light stand, the top light is red, the two middle lights are yellow and the bottom light is green. Each light uses an 11W/12 VDC halogen sealed beam light bulb. These lights are bright enough to be seen even during the sunniest day. 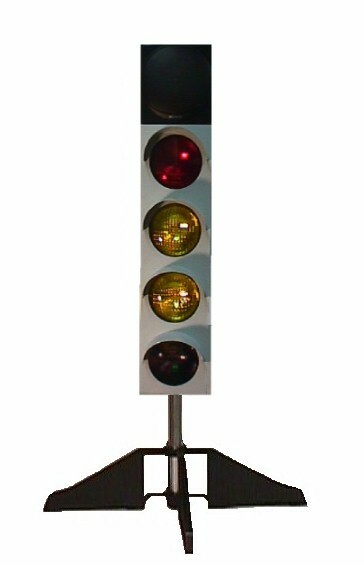 Measuring about three feet in height, the Light Stand is tall enough to be easily seen by all riders. A 40 foot cable connects the Light Stand to the AGC, allowing the lights to be placed where they can best be seen. The connector used between AGC and Light Stand is keyed, preventing operator error when attaching the cable. When not in use, a rear panel cable wind permits easy storage of the cable. The light stand uses a collapsible base which can be removed from the unit for easy storage. The base is wide enough (24 inches) to provide a solid mount under all conditions. It is even possible to replace the base with a fixed screw-in conduit connector (user supplied) for situations where the light stand does not have to move. Extra long 40 foot cable. Flexible placement for the greatest visibility! Bright 11W halogen light bulbs. Will work in any lighting condition! Flexible mounting. Use the standard collapsible base or a fixed screw mount! Works with any TARA Automatic Gate Control. Upgrade your system today!